Stauf USA, LLC, is a proud member of the U.S. Green Building Council (USGBC) and provides products that contribute toward satisfying Credit 4.1 under LEED. The U.S. Green Building Council (USGBC) is a 501(c)(3) non profit composed of leaders from every sector of the building industry working to promote buildings and communities that are environmentally responsible, profitable and healthy places to live and work. USGBC has developed the LEED® (Leadership in Energy and Environmental Design) Green Building Rating System. The LEED Rating System is the nationally accepted benchmark for the design, construction, and operation of high performance green buildings. 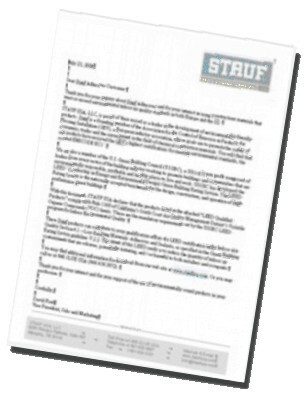 With this document, STAUF USA declares that the products listed in the our “LEED Qualified Products” comply with Rule 1168 of California’s South Coast Air Quality Management District’s Volatile Organic Compounds (VOC) limits. These are the mandatory requirements set by the USGBC LEED program for Indoor Environmental Quality. These Stauf products can contribute to your qualification efforts for LEED certification under Indoor Air Quality Section 4.1 – Low Emitting Materials: Adhesives and Sealants, as specified in the Green Building Rating System guideline V.2.2. The intent of this LEED credit is to reduce the quantity of indoor air contaminants that are odorous, potentially irritating, and / or harmful to both installers and occupants. The Stauf company has been a strong advocate for healthy, environmentally friendly products for decades, and we look forward to continuing to serve that goal as we develop new products and improve the products we have.